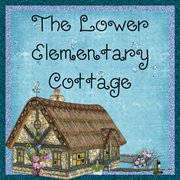 The Lower Elementary Cottage: Surprises, Setting Up and Sneak a Peek Linky! Today was spent working in my classroom. There were at least 6 of us teachers on campus for this adventure. All of us realizing we've done nothing to set up our rooms until today. I understand why we have to strip everything off the walls every summer, but it's still a pain to put it all right back up again. This year it actually worked out pretty well for me though. I'm moving a lot of things around and most of the wall stuff is going somewhere completely different. New students means I can make changes! I love my little kiddos with autism, but they freak out if I change even the smallest things between school years. And major changes are completely out of the question if I want to keep my sanity. I walked up to my classroom to find all sorts of happy surprises today! New benches in front of my class! Perfect for lunch, snacks, lining up, and just plain cute! As if my cottage classroom wasn't cute enough, I now have an adorable wooden sign that says it's my class with a little giraffe next to the title. There used to be this very odd window to nowhere, so I'm happy with the change. I always thought it was strange to have a fake window with a staircase wall on the other side. Now the space has a purpose. Pic is below! We got new reading curriculum!! I ordered it, but it's always a wild card whether it will show up on time. Almost all of it is in my room now, minus a few parts of the teacher package on back-order. We'll be using MacMillan Treasures now. Our old curriculum had great stories, but no vocabulary or comprehension component, so we always had to make that part up ourselves. Oh, and phonics didn't exist either, so I supplemented everything. I'm excited to work with the new stuff! My Classroom with new sign and benches! Once I got settled in, I started rearranging my classroom. I took before pictures, so I can post them all later along with the finished product. I left my room in a state of disaster today, so I'll be going back with another teacher tomorrow. We've got plans for working on our rooms and a Chinese take-out lunch break! Dropped off the school supplies. I figured the nightmare about them being stolen from my house the other night was a sign they needed to go live at school now. Set up my class schedule pocket chart. The times are totally off because I don't have an official schedule yet. Still waiting on last minute changes. Attempting laminating, but our *new* laminator hates us and jammed once again, eating my number poster. I salvaged it, and it's from the dollar store, so I don't really care. Just annoying that I couldn't laminate the rest of my posters. The tiny home one works AMAZINGLY but doesn't fit the big stuff. Started setting up my calendar, but got stopped in the middle. Mini meeting about how we're planning out common core, including the record keeping. I'll be adding quarterly check boxes to the CC Records I posted in my TPT store. That way I can keep the same sheets all year and add the checks in quarterly. Plus, I like the rating scale my fellow teacher came up with, so I'll add that in too and replace the current check-boxes. And I had one last surprise today! I got paged to the office and one of my new students (who I had for 2 weeks in summer school) came to drop paperwork off and wanted to see me! He squealed and ran to give me a hug. 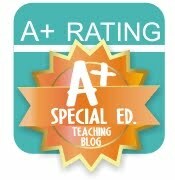 This is HUGE in the world of working with kids who have autism! Hugs are rare because they often get uncomfortable with touch. This was a happy omen for my upcoming school year! More planning and rearranging tomorrow! Last But Not Least: Sneak a Peek Linky! This Decoding Strategies pack has a GREAT set of posters/fliers that you can send home with kids so their parents will know how to help them with decoding. I lucked out and had 2 parents who are teachers last year, this is not usually the case. Parents need to know how to help their kids use the strategies at home, not just school! So cute too! I already had half of these I Spy products on my wishlist when she posted them up as a bundle for even easier buying! Super easy differentiated centers! These ones are for my little guys learning numbers and letters. I also got the sight word bundle for my first graders. Teaching 3 grade levels is not nice to my bank account! I end up buy 3 levels of stuff I can't live without! This is a whole unit of color words activities! Everything you can imagine to do with color words is here. be prepared for lots of laminating and cutting though! They turn out super pretty, and will be a great unit to start with for my kinder kids! Hi! I just found your cute blog on a blog hop. I'm your newest follower. When you get a chance, hop on over and check out my new blog! Oooooh! I want to see the inside! How cute! Thanks! I just posted pictures of the inside! It's in my newest post "classroom setup." 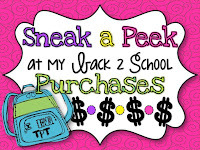 Go take a peek!